Los Angeles firefighters had to force their way into a property in Eagle Rock Sunday where a vacant commercial building was on fire. Responding to a call about 3:30 p.m. of a fire at 4537 N. Eagle Rock Blvd., firefighters encountered a vacant commercial building engulfed in heavy smoke, according to a statement on the LAFD Facebook page. 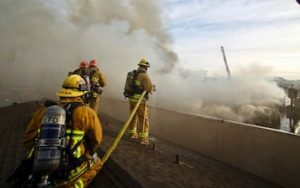 The 75-foot by 250-foot structure, built in 1968, was surrounded by security fencing and required forcible entry to gain full access to the building, according to the LAFD. Firefighters were forced to pull back at one point when the roof partially collapsed, but were later able to get the upper hand after taking safety precautions. A second building on the site was not damaged in the fire, the department said. It took just over an hour for the 98 firefighters deployed to the scene to fully extinguish the blaze. No injuries were reported.